Can I connect wireless keyboard and mouse to surf internet? Very Happy with the purchase of this TV. Features are stunning. Audio & Picture quality is good. I love watching Mobile contents on large screen with the use of screen mirroring technique used in this tv. I can also watch Hotstar. Interface is nice. highly recommended.. Go for it!!! The tv is amazing though you have to side load apps but the tv is worth the purchase. It’s a value for money TV. Picture and audioe quality is awesome. It has screen mirroring, you can connect wireless keyboard if you wish to surf interenet. Picture quality & Speaker quality is good. 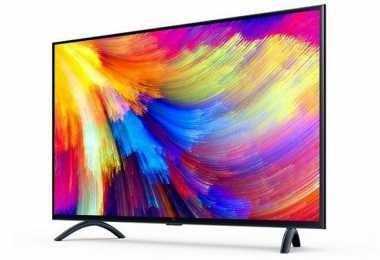 Latest price of Xiaomi Mi TV 4A L43M5-AI 43 Inch Full HD Smart LED Television in India was fetched online from Flipkart, Amazon, Snapdeal, Shopclues and Tata Cliq. Looking for a TV on a budget and at the same time do not want to compromise on the features? Then the Xiaomi Mi TV 4A L43M5-AI 43 Inch Full HD Smart LED Television has to be a perfect choice. The 43 inch TV is the ideal medium-sized TV for a large living room or a bedroom. The flat panelled Full HD LED display takes your TV viewing experience up a notch. Enhanced brightness and vivid colours give you life-like picture quality. The TV comes with the standard refresh rate of 60 Hz, which means there will be reduced motion blur in your videos and pictures. Also, the TV has a Full HD LED display with a resolution of 1920 x 1080 pixels, which is equivalent to 2x HD resolution. Improved brightness and contrast in the screens make the pictures appear brighter and clearer. Xiaomi Mi TV is a smart TV which is Wi-Fi enabled. The TV comes with built-in Wi-Fi support and an Ethernet port, to let you connect the internet to your TV. You can download apps, stream movies and shows, and surf the web directly on the screen with this function. And, among the other connectivity options are 3 HDMI ports and 3 USB ports. Not just the display, audio and sound also plays a crucial role in enriching your experience of viewing TV. The Xiaomi Smart TV comes with DTS sound technology, two speakers, and 20 W sound output. These audio features can let you have the theatre like experience right at your home, whether you’re enjoying a movie or a game of cricket. The Xiaomi Mi TV 4A L43M5-AI 43-Inch Full-HD Smart LED Television's price is set keeping affordability in mind, while not having to compromise on any features. And to add on to benefits, there are other exciting features like inbuilt memory of 8 GB with 1 GB RAM, 700,000+ hours of content, and one smart remote for both TV and set-top box.